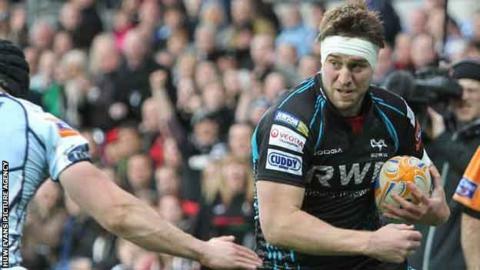 The Ospreys kick off their Heineken Cup challenge against Treviso on Friday with Ryan Jones desperate to make a success of the tournament. The back-rower has led Wales, won Pro12 titles, played in three Grand Slams and been a British and Irish Lion. But he has yet to win European silverware and said: "We are really looking forward to this tournament and looking to really lay a marker down. "That's a big one for me [and] it's something I believe we're capable of." After the opener against Treviso, they face former tournament winners Leicester and Toulouse - the latter arguably favourites to win Pool 2. And Jones also says while the financial state of the Welsh regions has led to less expectation overall among Welsh fans and pundits ahead of the 2012-13 tournament, hopes among players have not diminished. He said: "There's been a significant change that's been well-documented over the last 12 months, really. "But from the players' point of view the expectation's still sky high. "We're highly competitive. I certainly know I am and you always look forward to pitting yourself against the best teams in Europe." The Ospreys have never progressed beyond the Heineken Cup quarter-finals and in recent seasons have lost Jones's fellow Lions James Hook, Mike Phillips, Lee Byrne, Gavin Henson, Shane Williams and Tommy Bowe. But 31-year-old Jones is part of a formidable, near all-international pack that leads many in Welsh rugby to believe they remain nation's leading hope in Europe. He said: "We've really got our work cut out, but I believe we're capable of doing it, but it's [about] getting out there and getting it done. "For me it's the one big thing missing I suppose, one thing I haven't been fortunate in as part of my career. "You'll certainly know after the second round who's firing and who's not. "You only realise where you are as a team when the final whistle goes. "It's going to come down to key fixtures. "We talked years ago about winning your home games and maybe getting a win away from home would be sufficient. "But it's not [like that] now. "You've got to win them all now really, which when you're away to Toulouse and Leicester becomes a very, very tough challenge."